We track development assistance for human resources for health from 1990 through 2016 using methods developed by the Institute for Health Metrics and Evaluation for tracking development assistance for health and data from various international development agencies [11–14]. The Institute for Health Metrics and Evaluation defines development assistance for health as the financial and non-financial resources transferred by development agencies to low- and middle-income countries with the primary goal of maintaining and improving health. In this study, we define development assistance for human resources for health as the development assistance for health specifically targeted toward health-worker-related activities. These include activities such as health workforce planning, development of guidelines for health workforce management, pre-service and in-service training, postgraduate fellowship opportunities, additional staff recruitment, general support for work with health workers and construction of health worker training institutions. We utilize data from the following sources to generate our estimates of development assistance for health. For funds flowing through bilateral agencies such as the United States President’s Emergency Plan for AIDS Relief (PEPFAR), the Department for International Development (DFID), Australian Aid, Canada’s International Development Agency, global health initiatives such as the Global Fund, and multilateral institutions such as UN agencies and the EU, we extract data from the Organisation for Economic Co-operation and Development’s Creditor Reporting System (CRS) database. For funds disbursed by the Asian Development Bank and the Inter-American Development Bank, we use data downloaded from online databases, while for the Bill & Melinda Gates Foundation, the World Bank, and the African Development Bank, we use project-level data received through correspondence. Lastly, we use data from the Foundation Center for disbursements channeled through US foundations [15–18]. A detailed description of the methodology used to generate the development assistance for health estimates has been previously published . As the largest source of funding for human resources for health related activities since 2003, the US has channeled the majority of its funds through its bilateral agency PEPFAR and non-governmental entities. In particular, the re-signing of that project in 2008 included a goal of training and retaining 140,000 more health workers across PEPFAR focus countries . For most other sources of human resources for health funding, their own bilateral agencies have been the main disbursing agencies of these funds. Although other agencies have supported human resources activities that have broader utility in the health system, because the bulk of funding flowed through disbursing agencies with specific disease focus, the type of human-resources-related activities funded and the target regions have reflected this orientation. In this regard, sub-Saharan African countries in which the HIV/AIDS epidemic was catastrophic attracted and secured much of the funding related to human resources for health. The challenge here is that in health systems where there were shortages in health workers, redirecting health worker efforts to particular disease areas has been criticized as being detrimental to the broader health system [22–24]. The alignment between health burden, health worker availability, and funding is mixed. Relative to its disease burden, South Asia has modest health worker availability and receives a small share of both development assistance for health overall and specifically for human-resources-related activities. 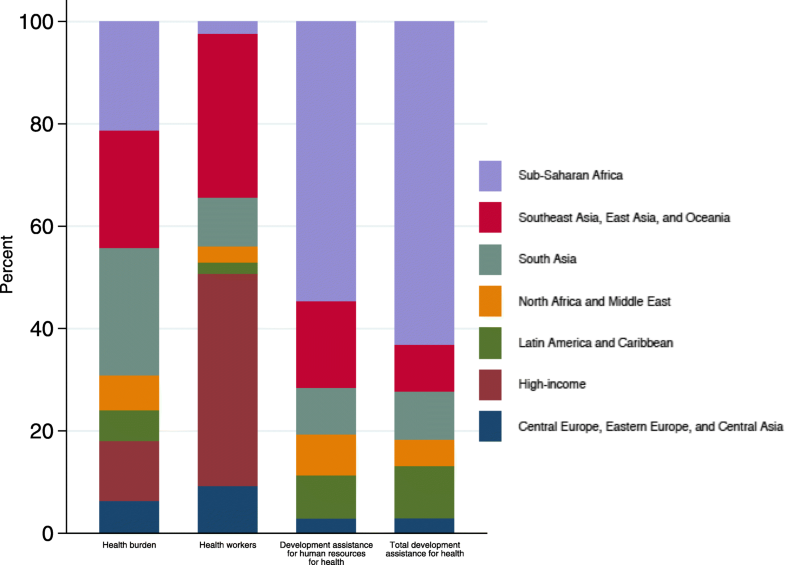 Southeast Asia, East Asia, and Oceania receives a relatively smaller share of overall development assistance for health, whereas the share of development assistance for human resources for health is larger. Besides Latin America and Caribbean, sub-Saharan Africa shows the smallest share of global health workforce availability and receives the majority of development assistance for human resources for health. The share of human resources for health related assistance targeted to Southeast Asia, East Asia, and Oceania is more aligned to its disease burden. Nonetheless, compared to the overall development assistance for health its share is disproportionately small. This misalignment speaks to a larger discourse in the global health spending arena regarding the criteria used by development agencies for the allocation of resources. This is an issue that is also important for the attainment of the Sustainable Development Goals. Several studies exist that suggest that the allocation of aid is largely driven by donors’ own strategic interests [26–28]. In other words, the amount of funding received by a recipient country is primarily a result of donor country objectives and not recipient country need. Some have argued that such a criteria limits the effectiveness of aid resources and makes recipient countries worse off in the long run. Without adequate resources targeted toward the areas most in need, improvements in health and well-being will be modest. Furthermore, the out migration of health workers presents a challenge to efforts to increase the stock of human resources for health available in low and middle income countries. The “pull” and “push” factors fueling migration have been extensively documented in the literature [1, 29–35]. In 2010, the 193 member states of the WHO adopted the WHO Global Code of Practice on the International Recruitment of Health Personnel in recognition of the challenges associated with the ethical recruitment of health professionals globally . One of the articles in the code encouraged high-income countries to provide financial and technical assistance to low-income countries to mitigate the impact of health personnel emigration. Future work will examine the association between the transfer of these resources and out migration of health workers.